Health administrators coordinate health office processes, oversee finances and so much more. Learn about educational options, college funding sources, career opportunities and salary expectations to get started. The American healthcare industry comprises one of the largest sectors of the economy. From small clinics to multi-state HMOs and hospital systems, qualified administrators plan, coordinate and oversee finances and the delivery of care every step along the way. Colleges, universities and medical trade schools offer online health administration degrees from the associate’s to the doctoral. This comprehensive guide to degrees in health administration helps students evaluate the pathways into the profession. Included is an overview of the kinds of online degrees available and the curricula that make up the programs. The online Master of Health Administration (MHA) in Health Systems Management offered by George Mason University prepares future leaders of healthcare, public health, and social service to gain the necessary skills to solve challenges in a rapidly changing and culturally diverse health environment. Learn More. 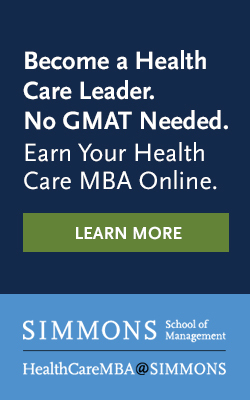 HealthCareMBA@Simmons is the Master of Business Administration in Health Care program delivered online from Simmons School of Management. The program is designed to develop and prepare professionals who are passionate about health care for leadership roles. Request Information. From the associate degree to the doctoral level, online students may encounter brief residency requirements for completing laboratory or research on campus. An online program is well suited for students who have family and work obligations that make it impossible to relocate for schooling. The online degree program in health administration contains much the same academic coursework and degree requirements as its campus and hybrid cousins. However, virtual learning requires dedication and determination to stay abreast of assignments and project deliverables based on a self-determined schedule. Lectures are streamed and student interactions conducted via chat and email threads. Many post-graduate online degree programs are ideal for people already working in the profession. Sarah was working as a secretary when she read about the burgeoning healthcare industry. She already possessed accounting and office management skills, so it was a natural progression for her to enroll in an online associate degree program in healthcare administration to prepare for a crossover into the healing professions. Sarah currently works as an office manager for a local medical clinic and has enrolled in an online bachelor’s degree program in administration. An online associate degree in health administration typically takes two years to complete and prepares graduates to find entry level positions with healthcare providers including hospitals, clinics, community health centers and long-term care facilities. Coursework in associate degree health administration programs covers the range of skills for entering the healthcare field, including healthcare practices, regulatory laws, technology, terminology, administrative procedures, basic anatomy and physiology. Students can survey their career options and determine whether they want to enter the field upon graduation or return to college to complete a related online healthcare bachelor’s degree. Introduction to Business 3 Students gain an overview of finance, management, planning, technology, human resources, and marketing. Medical Office Operations 3 A systematic look at medical terminology, ethics, patient management, coding and insurance practices. Introduction to Management and Administration 3 Development of leadership skills with a focus on healthcare administration, human resource and financial management and facilities planning. Healthcare Services Terminology 3 Continuing studies in terminology related to body systems and medical treatment. Medical Coding 3 Students master the codes and processes used in coding patient histories and insurance billing procedures. Business Communications 3 Covering the format and proper structure that goes into office publications, business reports, and employee communications. Accounting 3 Students learn the bookkeeping cycle and financial recording with an emphasis on non-profit organizations. Office Software Applications 3 Course includes beginning and intermediate skills in word processing, spreadsheets, presentations and databases. Samantha was a clinical caseworker at her county’s community welfare agency and hit a dead end in advancement opportunities. She had been initially hired with only a high school diploma in hand. Because of work and family obligations, Samantha chose to enroll in an online bachelor’s degree program in healthcare administration. Following graduation, she changed agencies and is now a programs administrator for a county commission on gerontology. The online four-year bachelor’s degree in health administration is designed for students who plan to work on the business side of the healthcare industry in hospitals, clinics, nursing homes, non-profit organizations and medical manufacturing firms. Students are introduced to key topics in healthcare management including accounting, long-term planning, ethics, marketing, quality assurance, emergency management, human resources and organizational theory. Graduates are trained to assume entry level management roles or, depending on the healthcare organization, mid-level operations leadership positions. Healthcare Ethics 3 Course addresses key issues in healthcare ethics including institutional compliance, interventions, organizational methodologies and patients’rights. Special Populations 3 Overview of demand and quality of care, and program finances for population groups including seniors, the mentally ill, persons with addictions and other areas. Management and Information Systems 3 History and overview of the management of information systems in health care settings. Topics include needs analysis, system design, and implementation. Healthcare Management 3 Administrative theory and leadership topics focusing on healthcare. Studies examine program planning, organizational structure, decision-making, change management and quality control. Healthcare Economics 3 The course takes a look at federal, state and community resources/payers, grant financing and reimbursement practices. Marketing and Healthcare Trends 3 Study how consumer trends influence the way healthcare organizations plan for products, services, and distribution channels. Legal Issues in Healthcare 3 This course provides an overview of health law, regulation, patient rights, malpractice, and access to service requirements. Healthcare Administration Internship 3 Students receive on-the-job training and participate in an organizational project relevant to their specialty. Juanita neared the end of her duty as a stay-at-home mother, having left her job in the accounting department of a community hospital. During her time away, the job had changed, and so had Juanita’s career objectives. She could either return to college to re-build her accounting skills, or she could take a leap of faith into management. In the end, Juanita applied and was accepted to an online master’s degree program where she’ll focus on healthcare financial management. Students typically take from two to three years to complete their healthcare administration program. Studies focus on honing executive-level management skills along with courses in the student’s chosen specialty in organization management, health information technology, finance and human resources. The master’s degree is considered a fundamental criterion by which management job applicants are evaluated. Graduates are prepared to oversee operations at a large hospital, a medical division, or at medical clinics and HMOs. The rigorous online master’s curriculum can also qualify grads to take managerial roles with federal and state governmental agencies, mental health/addictions counseling facilities, insurance companies, and non-profit service and advocacy organizations. Health Management 3 Review of the key skills in policy planning and delivery system oversight for leaders of healthcare service organizations. Health Information Systems 3 An overview of technology used to gather and store data in healthcare services. Topics include HIPAA and security issues, tactical planning, and more. Economics for Public Managers 3 Course is an advanced study of economic theory, budgeting, fund-raising, economic development and public spending. Foundations in Gerontology 3 Students delve into providing quality care for the fastest-growing group of Americans: the elderly. Policy Analysis 3 What goes into the development of public policy? Management students explore stakeholders, interest groups, forecasting, communication issues and the role of government. Health Law 1 Federal and state laws and oversight affect all public healthcare agencies. While meeting the law, healthcare administrators always juggle the quality of care with regulation. Creating Organizational Change 3 Healthcare organizations are in constant flux as they respond to influences in the economy, regulatory bodies, and resources. Course reviews skill sets used in conflict resolution and negotiation. Directed Study in Management 3 Students undertake research projects within their management specializations in healthcare administration. The online PhD or Doctor of Health Administration degree represents the pinnacle of scholarship for individuals who are health educators or policy makers. Studies typically involve extensive research into a medical topic related to the fields of management and require a defense of a written dissertation or clinical study. Doctorate degrees take either a scholarly research focus or center on administrative service. For administration professionals who want to teach, conduct research and publish, the online PhD, while formidable, is a solid choice. Governance and Public Policy Students focus their studies on democratic governance and public policy within their chosen specialty area in healthcare management with an eye toward practical application. Organizational Leadership The course focuses on organizational design, human resources management, enterprise and team building, organizational values, and governance. Leadership Ethics A study of the attributes, skills and strategies leaders use in managing diverse systems of employees, health populations, government and activist organizations, and the pressures of financing and quality service delivery. Healthcare Financial Management Review and advanced study of theory, terminology and concepts in developing, managing and controlling financing in a healthcare setting. Dissertation Doctoral students show the integration of their learning and subject matter competency by completing a research project on their specialty in healthcare administration.